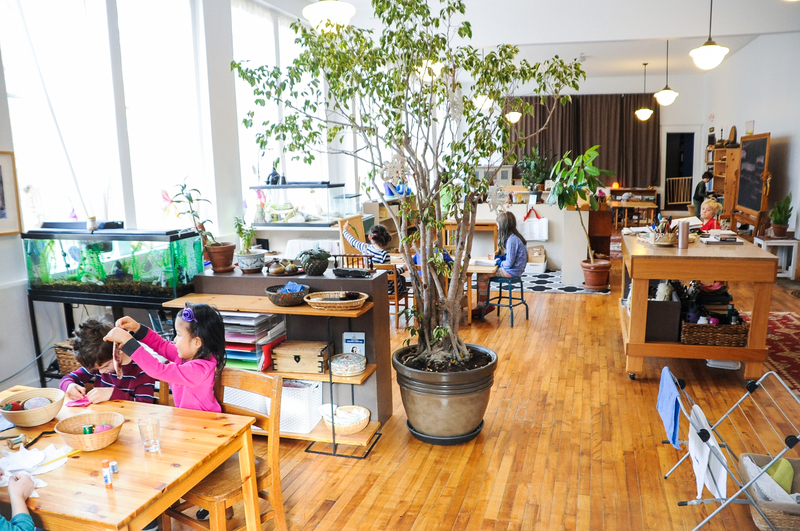 The elementary environment offers lessons that cater to the elementary child’s active imagination and reasoning mind. The elementary child is no longer content with the fact that things exist. Now he wants to know how and why they exist, how and why they function as they do. It is the reasoning mind that drives these new questions and allows the child to answer them with rational thought. The power of imagination allows the child to explore the universe, the earth and human society in its many manifestations (including those things that are invisible to the eye). Another characteristic of the elementary child is the clarity of and immense potential of the intellect. Children have an enormous need for work at this age. Because of this, we provide opportunities and time for big projects and intellectual endeavors. Outside the doors of the classroom students will find fruit trees, a grove of bamboo and many plant specimens to study. The elementary children will also take advantage of the school’s proximity to Ijams Nature Center. 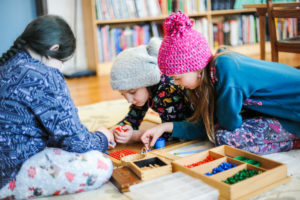 The plan that Dr. Montessori formulated for children between the ages of six and twelve is known as Cosmic Education. Through presentations, stories and lessons, the elementary child is offered a foundation of knowledge about the universe, the earth, its furnishings and human beings. Cosmic Education makes possible the construction of the child as an individual able to take his/her place in social life. 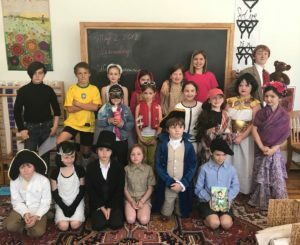 The elementary curriculum is integrated, meaning that there are many moments of teaching and learning that do not fall neatly into one subject area. Our hope is that the children will see connections and will gain an understanding of how various elements of the universe affect each other. The division of subject areas is not emphasized to the children. However, for the purpose of this explanation the curriculum will be discussed by subject area. The geography lessons are presented in such a way that they help a child to understand his/her world, why it is the way it is and why certain phenomena happen when they happen. In order to offer the universe to the child, we begin with the whole picture and the creation of the universe. From there, we explore some of the qualities of the elements, the sun and the earth. Also included are the work of water and air, human geography, interdependencies and economic geography. History is at the center of the Cosmic Education curriculum. It involves telling the story of human beings to the children and explaining that we are part of that continuing story. We hope to develop an appreciation for the gifts that humans have contributed and a feeling in the child that he/she will also be able to contribute something unique to the world. Many of the history lessons are presented as stories, often using timelines, charts and maps. The children will eventually make their own timelines and conduct their own research to learn more about a topic of interest. Beyond strengthening basic reading and writing skills, lessons in the language area feature word study, parts of speech, sentence analysis, punctuation, and the history of language. The children will also have opportunities to develop their spoken language through presentations, drama, and in-class communication. Because the curriculum is integrated, much of the elementary child’s practice of reading and writing skills will be done in relation to history, geography and science. These pursuits may take the form of research reports, interviews, biographies, original stories, plays and poetry. We expect the children to read every day, as reading enables children to explore and aids in the development of spelling. We will also read to the children to provide experience with a variety of written language formats: literature, non-fiction, poetry, myths and legends, historical sagas, etc. Since elementary children take great joy in intellectual activity, the study of geometry is perfectly suited for them. The geometry materials give ample opportunity for the children to explore the laws of geometry. This exploration is done in a concrete, sensorial way. Instead of memorizing theorems, the children experience the sensorial representations of theorems so that if they return to a study of geometry, they will have built a foundation for understanding. Geometry lessons in the elementary classroom build on experience gained in the primary environment and include the study of polygons, lines, angles, area and volume. At the elementary level, students will continue to use manipulative materials to gain an understanding of mathematical concepts. Once the child realizes that the mental process is faster than manipulating the materials (abstraction), he/she will no longer need to depend on the materials. Biology is treated consistent with the principles of Cosmic Education. It is part of the vision we wish to unfold and so it is not presented as a topic or subject unto itself but as part of the process of life. It is presented in relation to the factors that have an influence on plants and animals and in reverse, the influence that the plants and animals have on these factors. In this way, the child sees the natural relationship between life and the earth on which life is sustained. Through the study of plants and animals, the child’s capacity to observe, reason and classify is heightened. *The nearby outdoor environment is ideal for studies in botany, zoology and ecology. 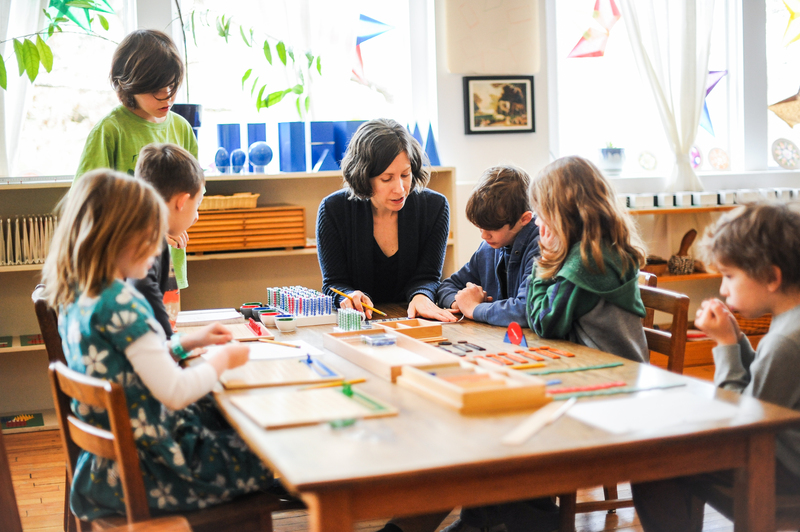 Artistic endeavors are intertwined with much of the work that the children do in the Montessori classroom. In addition, art terminology, instruction in the tools and techniques of various media and exposure to artists and schools of art are offered in formal lessons. Learning about music is similar to learning a language. Music has its own sounds and symbols, its own precise terminology. In the elementary classroom, the child will have lessons on music terminology in addition to opportunities for musical expression. Music listening as a group will also be offered in our classroom. Elementary children have begun to construct themselves as members of society. 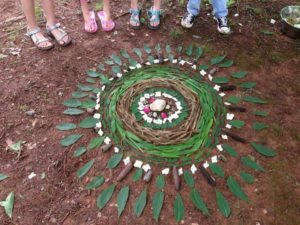 They have a desire for a greater degree of independence and therefore need opportunities to assert themselves in realms within and beyond the walls of the classroom. By offering a two-fold environment (inside and outside the classroom) we are assisting the child in the development of his/her full potential. Practical life exercises in the elementary are used to prepare the children for outside explorations. The termGoing Out is used to describe an event in which a small group of children leaves the classroom to study something that is not available in the classroom. Going Outs are organized by the students with guidance from the classroom teacher. The purpose is to provide an opportunity for students to explore phenomena that have been introduced in presentations. For example, we use a model of a river to introduce the work of water. In this presentation, we introduce the causes of river formation, the parts of a river and the work that a river does. To complement this study a group of students might decide to plan a trip to visit a real river. Through Going Out, the children gain practice being members of society in addition to insights or information pertaining to a particular study.